We tackle each new feature and improvement made to ApprovalMax with a simple goal in mind: to make your life easier. And that’s precisely what our latest enhancement to the platform’s Purchasing Solution has been designed to do. 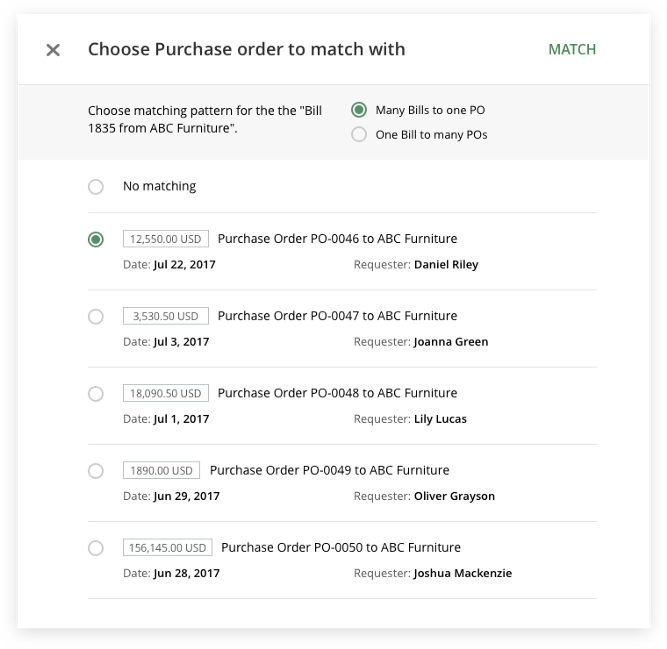 In this brief blog post, we’ll introduce you to our much improved Bill to Purchase Order Matching feature, and show you how it works. Previously, automatic matching of Purchase Orders and Bills was possible, but far from ideal. It required keeping the Bill reference number the same as the PO number, and this didn’t work when Bills had been captured via an OCR (Optical Character Recognition) system. 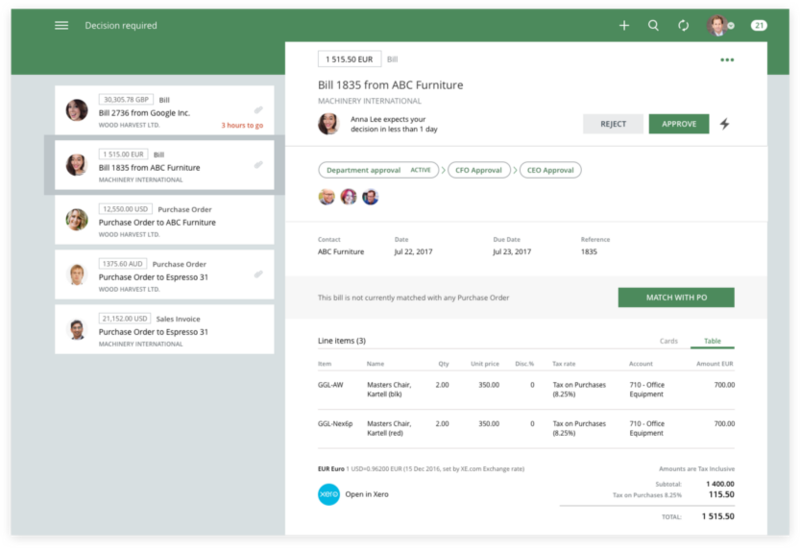 The new and improved feature enables Approvers to manually match incoming Bills with the original PO before making the approval decision. This allows for much more control and accuracy at this stage of the approval process. What’s more, limitations for approvals can be set to exert even more control. For example, you can ensure the total amount of an incoming Bill does not exceed the amount stated in the original PO, or that a Bill can only be approved if there’s a corresponding PO. And Bill to PO Matching allows reports to be run that display the PO balance (the amount of the PO minus the total amount of all matched Bills). Reporting also shows Bills matched with POs, and vice-versa, which is incredibly useful when it comes to an audit. If an auditor asks you to prove that your company is not wasting money, you can run a report to show that all Bills are matched with corresponding POs – something that is a typical requirement of government organisations. Bill to PO Matching is incredibly simple and easy to use. Let’s take a look at how this handy feature works in more detail. Note: This feature is currently only available for selected companies. If you’d like to find out more, email support@approvalmax.com. 1. First, you must enable the ‘PO Matching’ feature in the bill approval workflow settings. 2. After you’ve done that, you’ll see the ‘Match with PO’ button for Bills. 3. 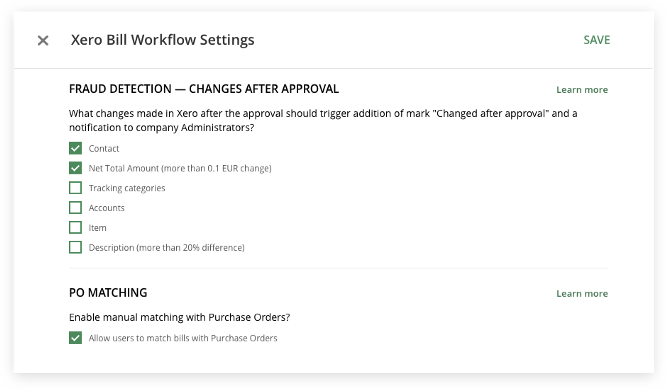 Next, select a Purchase Order to match with a Bill. 4. 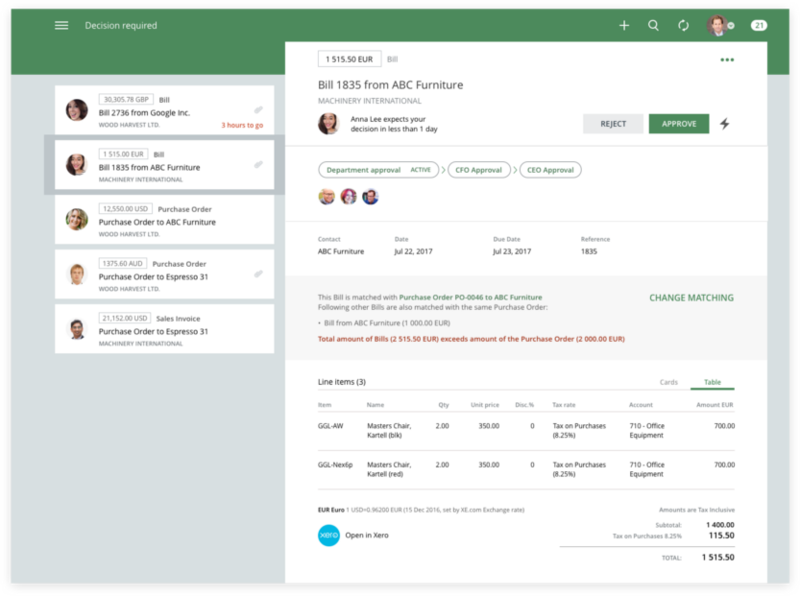 Multiple invoices can be matched to a single PO. 5. The amounts are then automatically checked. If the amount of all Bills matched to a PO exceeds the amount of the PO, a warning is shown to the approver. 6. Finally, after matching, it will be suggested to add the PO requesters as Bill approvers. Following on from our Bill to PO Matching enhancement, we are moving fast towards implementing a complete purchasing solution. We are currently working on ‘Mark PO as Billed’ features, in addition to PO balance reporting and PO accrual reports. Stay tuned, there’s more to come from ApprovalMax in the not-too-distant future. This much improved Bill to PO enhancement will give you greater control and access to more valuable information when it comes to accurately approving Bills. We’re sure you’ll see this as yet another invaluable function in your company’s approval process. If you’re not currently benefiting from ApprovalMax, find out more about the platform and its other capabilities by clicking here. Or if you’d like to try it out, sign up for your no-risk 30 day free trial here.